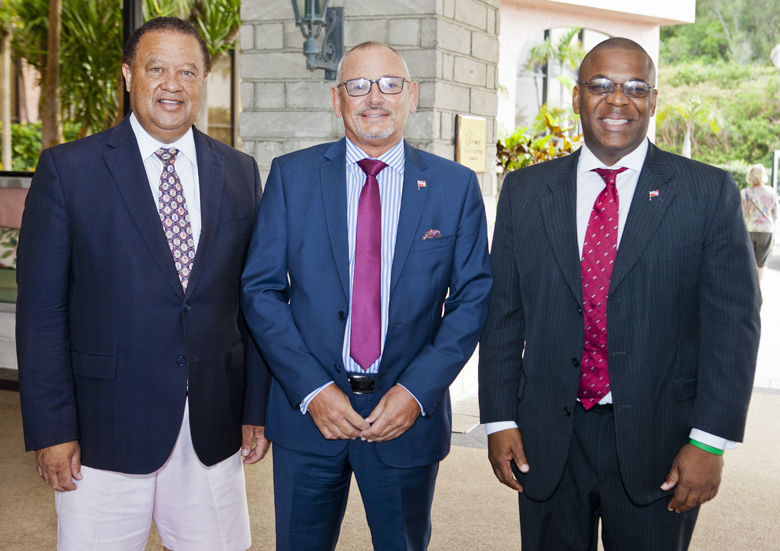 Deputy Premier and Minister of Transport and Regulatory Affairs Walter Roban opened the Bermuda Captive Conference today [June 12] at the Fairmont Southampton Resort. A spokesperson said, “He participated in an honours ceremony that recognized eleven corporations who have held a captive insurance company in Bermuda for more than a quarter of a century. “They join an additional 200 such companies who had already been elevated to Bermuda’s Captive Hall of Fame. Deputy Premier Roban and Junior Minister of Finance Wayne Furbert are met at the hotel entrance by the Chairman of the BCC Michael Parrish. 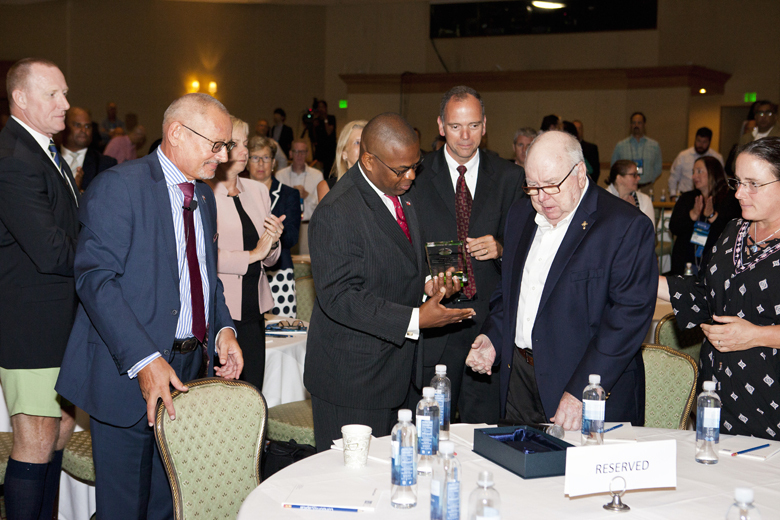 “The Deputy Premier also presented Bermuda captive industry pioneer Brian Hall with the Fred Reiss Lifetime Achievement Award. Deputy Premier Roban is introduced to Santiago Garcia of Caterpillar Financial Insurance Services, one of the companies recognized for having a captive in Bermuda for more than 25 years. The company is a subsidiary of Caterpillar Inc. Caterpillar is the world’s leading manufacturer of construction and mining equipment, diesel and natural gas engines, industrial gas turbines and diesel-electric locomotives. “I’d like to begin by welcoming those of you returning for this event, as the Bermuda Captive Conference is one of the most important captive insurance gatherings for the industry. “Today, it is an essential stop on the list of annual meetings where captive professionals can gather to discuss the latest developments in the captive insurance industry, and, network with peers and those seeking captive solutions. 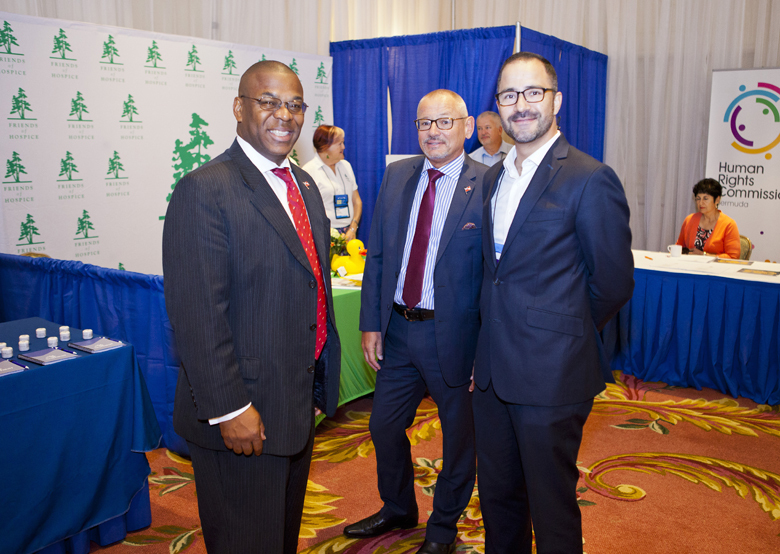 “So those of you who find yourselves here every year to share old and new knowledge with old and new friends, are the very heart and fabric of the Bermuda Captive Conference – and, a key part of what makes the captive industry a growing phenomenon to an increasingly wider segment of the world’s business community. “That growth is reflected in the record attendance at this year’s event. Congratulations to the organisers! “Growth in attendance means more corporations seeking solutions to their risk management needs are learning of Bermuda market opportunities. “Congratulations also to the many companies, some being recognised today, who determined the Bermuda advantages many years ago. “Those who are new to the industry, or even new to Bermuda, have come here this week in search of something – an education on some aspect of the captive business, a partner to help you resolve outstanding issues in your company, or even the expertise to help you set up your own Bermuda captive. “You couldn’t have come to a more beautiful place on earth to get the job done. And, you couldn’t have found a more knowledgeable gathering to get your questions answered. 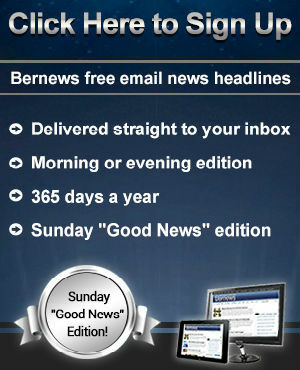 “Bermuda’s insurance market is incredible. For decades now, it has been providing the world with unrivalled expertise across several disciplines of the insurance industry. “The global leader in captives, Bermuda is also a major player in high-end, commercial insurance markets. Many of those who form captives here, find on-island commercial market solutions, as well. “Even captive owners in other jurisdictions have found reinsurance options in Bermuda. The reinsurance community in this island is a force in its own right. A leader in catastrophe reinsurance, these companies help communities across the globe get back on their feet after some of the worst natural disasters. “As the world’s largest captive domicile [both in terms of licences held and business written], Bermuda also holds 75% of global outstanding capacity of catastrophe bonds produced by Insurance-Linked Securities – $23 billion out of $31 billion at 2017 year-end. “The island’s globally significant property/catastrophe reinsurance market is paying 30% of the claims of 2017 hurricanes Harvey, Irma and Maria. “Captive insurance, commercial insurance and reinsurance, together with other financial services companies and a variety of support professionals – in areas such as law, accounting and banking – provide anyone interested in captive insurance with a significant cushion of expertise; and they can find it all within a city known for walkable distances. “Together, these market segments are providing solutions to companies, institutions and governmental organisations across more than 100 countries. “As a Government, it is important to us that we support these industries and provide what they need to keep them making the most of the Bermuda platform to the benefit of the wider, global community. “That means facilitating the flow of global commerce in any reasonable way possible to enable local industries to offer their leading edge products and services. “We recognize the need to maintain global standards, and, we must commend the Bermuda Monetary Authority, which has been an impressive supervisory stalwart across all of our financial service undertakings. “We believe the BMA’s integrity, sterling reputation even among the world’s other regulators, their forward thinking and a continued emphasis on their own development, has given Bermuda businesses the confidence as global providers. “Furthermore, the Authority continues to incorporate new technology into its supervisory processes with the introduction of an electronic statutory filing system in 2017 to allow for more robust data collation on filings for Bermuda captives and Special Purpose Insurers. “The BMA has continued an emphasis on developing its global regulatory standards and continued its cooperation with other international bodies. “This includes the International Association of Insurance Supervisors, the National Association of Insurance Commissioners and the Group of International Finance Centre Supervisors. “I hope you enjoy the Bermuda Captive Conference. It is a great opportunity to learn and grow in ways that can be of great benefit to your organization. “It’s an opportunity to network with the leaders in the captive industry. Deputy Premier Roban presents Brian Hall with the Fred Reiss Lifetime Achievement Award, as audience members rise to their feet in appreciation. “So, starting with American steel companies, Fred Reiss pursued the concept in Bermuda and launched the first captive in 1962. As you all know, captive insurance recorded exponential growth over the next five decades, distinguishing Bermuda as the world captive leader. It also laid the foundation of the island’s entire insurance industry. “We created the award to celebrate the collaboration of outstanding captive insurance industry professionals. The inaugural winner in 2016 was Jill Husbands, the former chairman and managing director of Marsh IAS Management Services [Bermuda]. Last year’s awardee was leading Bermudian corporate lawyer Michael Burns. “And we’re very proud to present the third Fred Reiss Lifetime Achievement Award to Brian Hall. Brian is probably well known to many of you for his notable insurance career spanning more than four decades on the island. “Born in 1941 in Denton, near Manchester, UK, Brian moved to Bermuda in 1958 to join his parents, and got a job at age 17 working for American International Group [AIG]. In 1964, he was hired by Fred Reiss as a captive account manager for International Risk Management, Reiss’s company, where he spent five years. “Brian later launched his own firm, Inter-Ocean Management, that began running captive operations for global insurance brokerage Johnson & Higgins. He was named CEO and president in 1979, and later chair. J&H Global Captive Management grew to 17 offices and 400 employees worldwide. I’m proud to say I was one of them—and had the privilege of working with Brian before J&H merged with Marsh & McLennan in 1997. “A Bermudian, Brian is a graduate of Saltus Grammar School. He served as chair of the Insurance Advisory Committee, was a board member of Renaissance Reinsurance, and also helped create the Bermuda Insurance Management Association [BIMA], today the captive sector’s primary industry organisation. Today, he remains professionally connected to Bermuda through his continuing partnership with Oyster Consulting. “Importantly, Brian helped develop the industry’s future through educational initiatives. Among his many roles and achievements, he founded the Bermuda Foundation for Insurance Studies [BFIS] in 1996 and became its Chairman Emeritus. BFIS provides opportunities for Bermudian students to gain necessary education and training to enter the insurance sector. “He also led the Board of Governors as chair of the Bermuda College. In 1998, Brian was nominated by Bermuda’s government to receive an Officer of the Most Excellent Order of the British Empire [an OBE] by the Queen, for his services to the insurance industry. “Brian is a true pioneer in our captive industry. His contributions to both insurance and educational organisations in Bermuda have demonstrated his long and sincere commitment to the island—and to generations of Bermudians who have followed him into the industry. Indeed, much of the success we enjoy as a sector today can be attributed to Bermuda-based entities he led and inspired. Oh no they sent Wayne. All the best, my beloved plp.